There were five fine singers on stage in Jordan Hall on Wednesday evening, only one of whose lips moved. Fabio Bonizzoni brought a small contingent of his Italian early music group, La Risonanza, for an almost all-Handel program as part of the currently unfolding Boston Early Music Festival. Two violinists, a cellist and Bonizzoni at the harpsichord played with electrifying style and beauty, and they sang through their instruments as surely as the remarkably gifted soprano Roberta Invernizzi did through hers. We heard three of Handel’s sophisticated Italian solo cantatas, two Trio Sonatas for two violins and continuo dating from his English years (B minor, op. 2; G major, op. 5) and a curious, but startling non-Handelian extra, a Passacaglia variata movement from Michele Mascitti’s (1664-1760) Concerto Grosso, Op. 7, No. 4. 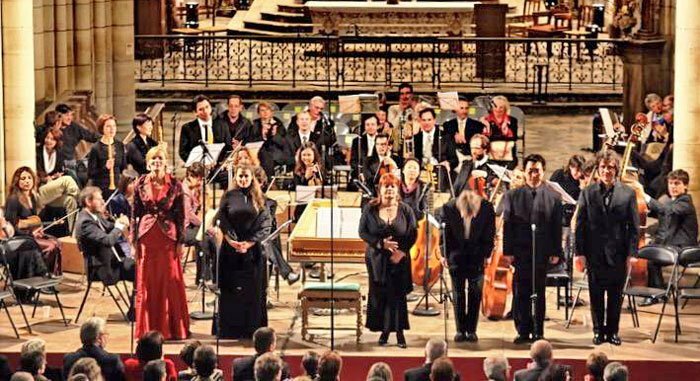 The concert was titled “Handel: From England to Italy.” It began with an English work and closed with an Italian one but, other than that, what exactly was it that we were supposed to infer from the title? The program was so well balanced that everything spoke elegantly for itself and no referencing or contextualizing of chronology was required. Bonizzoni’s La Risonanza has a large history with Handel’s Italian cantatas and it showed. This vast repertoire is still too little known by the continually expanding audience for Handel’s operas and oratorios. However, with Invernizzi on hand, joined by the extraordinary violinists, Ana Liz Ojeda and Claudia Combs, and the seemingly joined-at-the hip continuo of cellist Caterina Dell’Agnello and keyboardist Bonizzoni, we were blessed with an ensemble of equals where all breathed the same air of experience and ability. Considering the vastness of the cantata repertoire, the teasingly small sampling we got only whetted the appetite for more, much more. The texts, dealing with love—sought, lost, or something in between— are not distinguished. What they have is what Handel always needed: evocative imagery relating to human relationships, the natural environment or anger/fury/violence of one sort or another. He never failed when these were present in the texts poets gave him. In Mi palpita il cor, the first cantata in the program, written shortly after Handel arrived in England, the opening secco recitative, quite normal in its progress, is interrupted violently at the words mentioning torment and jealousy. Once that emotion has been voiced, we return to what is essentially a love poem about love unrequited. The MIT Handel Scholar Ellen Harris calls this an expression of desire that is “completely ungendered: it could be sung by a man or a woman to a man or a woman.” She explores the ambiguities in this aspect of Handel’s life and work extensively in her exhaustive study of the cantatas, Handel as Orpheus. In Mi palpita the singer and solo violin (originally oboe) carry on a dialogue that is hopeful but likely doomed. All three cantatas abound in surprises. In Alpestre monte the narrator threatens to climb a mountain and die there, apparently thinking this will induce his beloved at least to come and bid him farewell there. The opening accompagnato pictures the scene but cannot prepare us for the stabbing staccati with which the first aria begins. This is a truly shocking movement dealing with “horror” and “horrible fierce ghosts.” Invernizzi and her instrumental colleagues ripped this piece to shreds; one of the highlights of the night—truly terrifying. By contrast the concluding aria is a sort of pre-need self-elegy. Handel takes it seriously: heart breakingly supple descending lines that gently skip up to descend again and again in both instruments and voice. The final cantata of the evening was the longest, an extended nocturne of supplications to a beloved from a not entirely forlorn young man; this fellow is still hopeful. There are four alternating recitative/aria combinations, the most moving one for me a duet between singer and solo cello, Luci belle/Vaghe stelle, brilliantly executed by Dell’Agnello and Invernizzi. Roberta Invernizzi is a most impressive artist, a welcome addition to a happily growing community of sopranos of prominence who not only understand Handel’s music but have the chops to execute it in all its variety. She eschews a straight-tone style except where it’s needed, and in those places it becomes a breathtakingly expressive tool. She embellishes stylishly, but with restraint—she doesn’t feel compelled constantly to improve Handel’s lines—but she’s not afraid to show us what she’s got; this is a delicate balance. She is responsive to text— words, sense and context— and shapes lines with sophistication. In this performance she was unfortunately too often score bound, not a musical weakness, but one that distanced her too much from her audience. Her eyes are wondrous; we wanted her to look at us, to tell us these incredibly beautiful and touching musical stories; this was not a recording session. Roberta Invernizzi is unquestionably a major artist in this repertoire, and likely in others too. The two trio sonatas were excellently performed by the instrumentalists. It was nice to hear within those movements some tunes we recognized from other places: the oratorio Athalia, an aria from Agrippina, and others. And the great surprise of the evening, the passacaglia by Mascitti: a knockout, brilliantly virtuosic all around, full of invention, and confirming once again the value as collaborative artist and soloist of cellist Caterina Dell’Agnello. She and Fabio Bonizzoni are anchors of an excellent enterprise, a collaboration of inestimable value at the southern end of the European continent. At the end the audience had not had enough and the performers courteously offered up one of Handel’s most delicious arias, Lascia la spina, from the oratorio Il Triomfo del Tempo e del Disinganno, more familiar to most as Lascia ch’io piango from the opera Rodrigo, and which had an even earlier appearance as ballet music in this week’s BEMF opera Almira. Delicious indeed! A hearty thank you to Bonizzoni, Invernizzi and their spirited colleagues. Come back, please, and bring a few more of your colleagues next time. Donald Teeters retired last year after 44 years as conductor of The Boston Cecilia where he led the group in performances of almost all of Handel’s oratorios in period instrument performances. He has also conducted the major works of Bach as well as later composers, including prominent New England contemporaries. He leads graduate seminars at New England Conservatory in studies of Handel’s large scale English language works and the two Passions and Mass in B minor of Bach. He is longtime music director and organist at Brookline’s All Saints Parish.